This is my first review back from the trade show so I'm going with a cigar that I've been looking forward to ever since Pete told me about it at Smoke Inn's Great smoke last February. 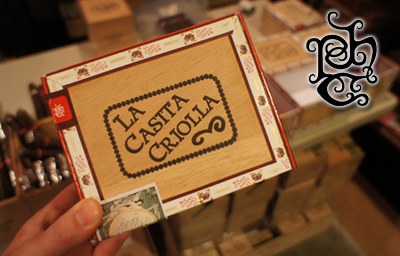 The Tatuaje La Casita Criolla is a 100% broadleaf cigar made at the My Father factory in Esteli, Nicaragua. The stick comes in three sizes -- none of which top the 48 ring gauge, which is a nice departure from the trend of the big-sized cigars most companies are putting out these days. (Side note: I've actually started to turn to the dark side and like some of these beastly sized smokes, but I digress.) I had a lot of time to hang out with Pete Johnson (owner of Tatuaje) and ask him about this blend. 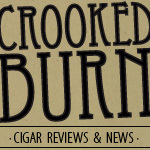 Quote Pete Johnson: I wanted to do something different and something that pays homage to the broadleaf cigars made in the U.S. many years ago. These stick is a lot different than anything else we have put out and I really hope it is as widely accepted as some of my more core lines are. I want to thank Pete again for all his time he spent with me and my partners at Cigar Explorer during the crazy four days of the Vegas trade show. He is a great guy in the industry and is truly honest and face value. Enough of that.. let's get down to what really matters. The La Casita Criolla I grabbed out of one of the fresh boxes at New Havana Cigars has a beautiful dark wrapper. Dan Welsh (@NHCDan on twitter, owner of NHC) told me that there has been some difference in shades between boxes, but for the most part they are all as nice a looking as this one. The dark brown color is consistent all around the wrapper and has no blemishes. 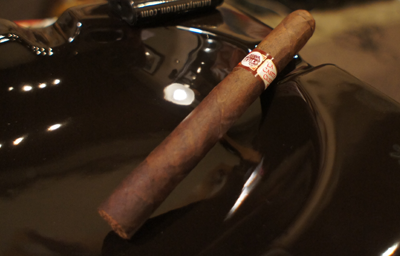 The band on this cigar is the original artwork of the old Cuban brand of cigars by the same name with a Tatuaje twist. I have to say I dig it. It's a very graphical band, but does not come off as showy or too flashy. It's different enough to stand out on the shelf, but not tacky. Well done. The pre-lit aroma screams classic broadleaf. I got a lot of the dark earthy smells, mixed with some dark berry/blackberry scent, especially at the open foot. The cold draw was nice and free and had a rich leather taste with a lot of sweetness left on my lips. 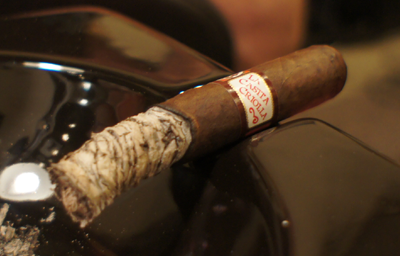 Lighting this La Casita Criolla was a breeze and the flavor started pouring out from the first puff. This was exactly what I remembered from the first La Casita Criolla I smoked at the trade show. Lots of rich creamy leather flavor on the front with a smooth, almost syrupy sweet finish. The smoke felt so thick that it's one of those cigars you will love to chew on. The part that really blew me away is just how heavy the smoke felt on my palate, yet after you exhale, within ten seconds your mouth feels clean and refreshed. I really don't care for cigars that make my mouth feel coated from top to bottom with smoke flavor the entire smoking experience. I like a little break in between puffs, and this stick delivers. The strength was in the medium range and the construction was excellent. The second half on my La Casita Criolla was pretty consistent with the first half (which was awesome) with just a slight change in some of the flavor. The finish was still very sweet and refreshing, but the front now not only had that rich leather flavor, but I was picking up hints of cocoa. It was a mild flavor, but added just a little bit of interest that I was not expecting. Something to note here that I didn't put in the first half is the characteristics of the ash on this stick. The ash on the broadleaf filler does NOT hold long in this size. I accidentally wore this ash twice while smoking the cigar. Make sure you are careful and knock it off at about the 1/2 inch mark. I smoked this cigar all the way until I burned my fingers. The strength never picked up and stayed right in the medium range and I never had any burn/construction issues. 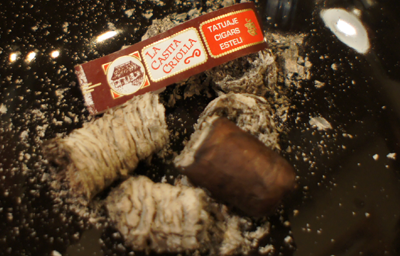 My final thoughts on the Tatuaje La Casita Criolla? Ever since I got back form the show, I have been craving more and more of this cigar. If you've seen any of my IPCPR recaps on twitter or the message boards, you will already know that I called this cigar one of the top three of the show. It's not the most complex blend you will ever smoke from Tatuaje (remember this year's La Vérité) but it doesn't need to be. It's very relaxing, easy to smoke and jam packed full of flavor. An absolute winner. Would I buy it again? This is where things get even better. The price on these guys is fantastic. If you're a Tatuaje fan but normally lean towards the Red Label line because of cost, here is another option for you in the same price range. Yes, I will buy more. Would I buy a box? This is 100% box worthy and will be my next box purchase when they are back in stock. Dan Welsh told me he was getting more this week so check out his site if you're looking to grab some soon.